When I was a senior at the University of Utah back in 2000, I carried a full course load in English and journalism, worked 25 hours a week at a retail art supply store, and burned 20 more hours a week as a reporter for the Daily Utah Chronicle. With whatever free time I had left — minimal at best — I was fairly active in environmental causes. I contributed to the Terra Firma Club and campus recycling projects. I traveled to Southern Utah to document ATV abuse in wilderness study areas. I helped drag deadfall over illegal trails. I researched the destructive influences of the beef industry on the Utah desert. I campaigned against the Legacy Highway. And every Wednesday afternoon — my only day off work — I planted trees with Vaughn Lovejoy. Vaughn Lovejoy is the founder of Tree Utah. In the spring of 2000, his big project was planting native species in the riparian zone of the Jordan River near 106th South. It was one of the few patches of land left in the Salt Lake Valley that hadn’t been consumed by suburban development, although the condos were encroaching fast. During one particularly warm day in April, we labored for four hours until my clothing was drenched in sweat and my hands riddled with blisters. I looked up at the new condo project going up near the freeway and casually asked Vaughn if the meadow we were re-greening was definitely going to be preserved from future development. That conversation with Vaughn Lovejoy was the catalyst for a shift in my views on environmentalism during the past decade. Yes, I still think conservation is important. So is environmental awareness, healthy habits and respectful stewardship. Because this generation, my generation, and the several that will follow need open space and clean air and nutritious food and water. But in other ways, I have, like Vaughn, come to accept a sort of eco-nihilism. What we’re doing to save the Earth from ourselves is just too little, too late. Take everything we’re doing — the recycling, the cleaner energy sources, the efforts to preserve tiny tracts of still-natural lands — and really put it in context. Think about population growth, the developing world, and the energy needed to fuel the current rate of expansion. Spread it out in a big picture. Recycling’s not even going to make a dent, and neither are bio-fuels or technological innovations that make our consumption mere fractions of a percent more efficient. The only changes that matter are going to have to be quite drastic — as Beat likes to say, “Get fusion working. Only solution.” Only a truly impact-free energy source can spark the meaningful change the world needs to return to the way it was. Otherwise, I truly believe, we’re just planting trees in front of bulldozers. Killing them? Really? Yes, races produce a negligible amount of waste and usually cause small amounts of trail damage. And of course many people travel to races by means of fossil-fuel- burning modes of transportation. And there are shoes, bicycles and other pieces of gear that need to be manufactured and shipped. But put that in context. There are no hard numbers for trail running or mountain biking. But in 2009, there were 41,000 Ironman finishers worldwide. In 2007, there were 400,000 marathon finishers in the United States. Regular trail runners probably number less than 200,000, and long-distance trail runners possibly less than 20,000. The potential for significant negative impact in a world of 6 billion humans is so small it’s laughable, and yet here we are, encouraging fellow outdoor enthusiasts to stay home. In Dakota’s defense, he did encourage runners to keep running and take small steps to reduce impact, but the sentiment still lingers in his article — this idea that runners are hurting the mountains. Or cyclists. Or anyone who truly appreciates the environment as it stands, today, amid the pollution and climate change, for what it is — a beautiful place, a beautiful moment, that makes people happy. I don’t know what the world will become in the future, but I do sometimes think about Vaughn, his trees, and his serene smile toward that row of condos. I think of doing the things that make me and the people I know and love happy, while I’m alive. I really like your perspective on this. Thanks for your point of view. The way I see it, the true benefit of environmentalists and do-gooders is not that they actually do good, because that IS completely negligible - but that they are a voice that trickles into mainstream politics and policy. That is what was powerful about the green party in germany in the 90s, and this is still what is powerful about people with such interests. Trail runners I believe have a vested interest in parks and health - and this lobby is what is good about it. Our use of shoes, airplane travel and such is SO small compared to mainstream travel in the USA alone, the benefits of the lobby effect by far outweighs any negativity. Now it adds credibility to our voice to be consistent in our own behavior, that is true, but it should be realized as such. If you run any sort of numbers, with billions of poor people in emerging economies burning dirty fuels and half of the USA driving ridiculously overpowered vehicles it becomes very quickly clear that any actual impact is measured in fractions of a hundredth of a percent. Moreover one has to be careful to be all too self-righteous. Do you really think you could feed 6+ billion people with local organic produce? Of course you couldn't. Not use transportation? Fuel? Should we deny most of the world progress? Who decides that? The way things go, without dramatically reducing world population, the only way out of this mess is progress. I always thought that fusion could be made to work (and yes, I do know a little bit about physics, and the benefits of fusion would be akin to the industrial revolution), and so do other physicists I talked to - a global manhattan project style effort could get it done. The issue is that there's no real reason to - there IS enough oil (for now). The naysayers who predicted us running out of gas twenty years ago, then ten, have been repeatedly disproven by advances in oil extraction and have done global environmentalism a great disservice. One has to be careful about idealistic arguments - they can backfire greatly. In that sense, enjoying nature makes us the greatest genuine advocates for our environment. Dakota borught up some good things, and some invalid ones (if you think that ultrarunners not traveling anywhere by plane would even cause one flight to be cancelled, that would greatly surprise me. So then by not going there, you're not saving anything, really ... however if you invent a jet that uses just 0.5% less fuel, and get airlines to buy them, you just made an impact that is incredible). I think we should focus on what's important to us - pristine parks, access, having wildlife - and there is a lot of good to be done. Recycling- the other truck that goes to the dump. Maybe not, but I have my suspicions. Beautiful, Jill! A most excellent post! "Take everything we’re doing — the recycling, the cleaner energy sources, the efforts to preserve tiny tracts of still-natural lands — and really put it in context. Think about population growth, the developing world, and the energy needed to fuel the current rate of expansion. Spread it out in a big picture. Recycling’s not even going to make a dent, and neither are bio-fuels or technological innovations that make our consumption mere fractions of a percent more efficient. The only changes that matter are going to have to be quite drastic"
-- we are at 6.5 billion people and counting. we burn through 86 million barrels of oil per day. Each gallon contains 30000calories. a barrel contains 43 gallons. All that energy we burn, essentially waste from millions of years... waste that momma nature found unbalanced, so she reset the planet with her ways (ice age). We humans are merely advancing the weather patterns by thousands of years ahead as we burn through our energy hungry ways. The sad thing is, we are far too addicted to change now. the economy is the number one driving force of this show. we would need a miracle to change. we need huge huge changes (eg work from home etc..). but, that would mean overhauling our economy and its ways. Something no politician has the gonads to do.... its against public belief. The economy is the number one focus... yet, the economy is what's killing us dead. Its unsustainable like some crack addict! Jill - a voice of reason speaks on this touchy subject! I share your perspective. One of your better posts. A nice post and I really enjoyed it and your thoughts. I really agree that it's all about energy. You know, we use so much more energy than our Grandparents ever dreamed of.... But if we can just figure out how to harness fusion or zero point energy or figure out gravity, all of which are now out of reach, we do stand a chance of not destroying our world. For now, we have to keep on trying to protect our Parks, our Lions and Cheetahs, our Wolves, our Great Bear, the Tongass, the Everglades and whatever is in your backyard, like Noah herding the animals into the Ark. Give us enough energy and we can easily recycle anything, mine asteroids instead of that beautiful pristine area down the road, and go to the stars. Yes! You've said everything I've been thinking the last few years, but more eloquently than I ever could. Regarding the Ultrarunning dilemma, I suspect that Ultrarunners spend so much time out of doors that they appreciate a love of nature and their place within it. I would have thought that holding such races would raise people's awareness and encourage them to shrink their footprint in other ways. Something to think about, anyway. Boy oh boy Jill, how dare you (and Beat) offer up such politically incorrect but practical points of view. There will always be those who would dictate and force others how to think and act, for the greater good of course. But no mater how successful efforts are at forced behavior, in the long run the nasty ol economy always comes out on top. This is not only inevitable but desired because; Humanity’s ever replenishing supply of new thinking from those nasty leading edge wackos , be they artists, statesmen, philosophers or environmentalists, always eventually combines with the nasty economy, like it or not, to move us forward. Good post; really great perspective on the issue. "Get fusion working. Only solution." I am a high school physics teacher in upstate New York, and I couldn't agree more. Thanks for putting it so succinctly Beat. I may need to steal you 5 words. Jill, as always, thanks for inspiring your readers to get outside. I have probably read almost everything you have ever posted online, mostly because it gets me outside more. 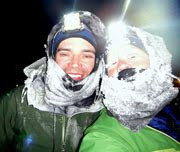 Your write-up of your Great Divide experience was one of the most amazing stories of human endurance I have ever read. Thanks for sharing your experiences with such an honest writing sytle. You guys rock. Glad to see you hooked up with a physicist. First time to your blog, very inspiring and cool! way to go! Good stuff as always. I was a little worried where your post was going but it ended well. Something to keep in mind is that we can enjoy our lives and try to reduce our impact, if only to give us enough extra time to make big discoveries like Fusion. Keep running. The world is going to hell in a hand basket. Who is carrying the hand basket is pretty obvious to those that have a brain and keep their eyes open. Me ... I am going for a ride. Today is one day closer to my last hand basket ride. I'm an aging hippie who works in wilderness cleaning up after thoughtless people. While I don't like seeing crowds of people in the woods, because solitude is precious, I think people have to go there to appreciate it, understand it and support it. But--do people really have to leave behind so much trash? It's sometimes a struggle not to think of people as the enemy and that they are killing the wilderness when you continously find toilet paper flowers, cans, bottles, old shoes, soap in the river, etc. But I go on because I care about the place. None of this is directed at ultrarunners BTW. They come through, they're gone. If the trails are chosen that are durable, non-eroding and can take the use, why not? Thanks for another very well written and insightful essay Jill. Greatly appreciate your work. I have to differ from those who think the best use of natural areas is to keep people out of them in order that they remain virgin and untainted...like formal living rooms that no one is allowed to sit in. If no one is allowed into nature, who will be it's advocates? ENCOURAGE hikers, runners, bikers, campers, horses and the like. The love they (we) develop for the outdoors will create an army of people ready to go to the defense of these areas and demand more of them. The small damage we do will be far offset by the awareness of the environment that these activities engender. And I find that almost without fail, when people get outside and enjoy nature, they begin to develop concerns about pollution, recycling, energy policy, and all the other things that "environmentalists" are trying to preach. This mindset comes as a bundle and it starts by getting outdoors, not by leaving the wilderness untouched. I'm pretty sure that ultra runners create a far bigger footprint from all the flying/traveling they do for various races than the actual running itself. Jill, I'm with you in general sentiment. Even the broadest world events still need to be viewed within the context of individual lives and capabilities. That's not a capitulation or failure, that's the nature of life, and we should be proud of taking the responsibility for weighing what is important to us and acting on it, regardless of the particulars. For some, this may mean very little in the way of environmental action. For others, it may mean a lot. Yes, we value the outdoors, but we also can't just be shut-ins and abandon those we care about, or activities we love, simply because there is a side effect. Life, by its nature, has side effects. I've always been amazed at the environmentalists who want to keep people out of areas to preserve them. That just makes no sense. And then (as a mt biker) all the other users who claim that ONLY the mt bikers are doing trail damage. To USE a trail is to damage it. Hikers, horses, bikers...we use a trail, some damage is done. The trail's very existance is damage...the trail wasn't always there. Where (and who) gets to draw the line and make decisions on who/what is allowed? Tho I agree that there needs to be some kind of regulations. And Mary, I feel your pain (on the trash people leave behind). I am constantly amazed by how much trash I find lying on the trails (that I will typically stop and pick up if feasable). I like to think of myself as an ambassador to the outdoors...I'm always extremely courteous and kind to hikers and horses I meet on the trails. And I NEVER ride when it's muddy (on purpose I mean...once in a blue moon I'll go out WEEKS after a rain and there are still some muddy spots...I can't help that...but I do pick-up and carry my bike around those areas...same for all water crossings). Just trying to what I can to minimize the evidence of my passing. Oh...and HEY! Beat has a Blur? Congrats! It's an AWESOME bike! (I've had a mine for about 5 years now). Up until about a year ago I was up in Sunnyvale for work a few times a year, 30 or more days at a time. I'd always bring my Mt bike...it's amazing how much public land is so very close to SO many peole! My fav mt biking trails (so far) are the Purisima Creek Redwoods. Less than 30 minutes drive from the Mt. View/Sunnyvale area (in light traffic times I mean). I park in the village of Woodside and road-ride up the Kings Mt Rd where it intersects the Skyline Rd (about a 4 mile 1800' climb up a SWEET curvy road thru the redwoods!) There you turn right and after about a quarter mile on your left is the first parking area/trailhead. Take that downhill...it's a BLAST! 1800' down, then you can come up the 'northern' side, which is nearly all singletrack. Just below the top of that (which also has another larger parking lot for the trailhead) there is a connector trial that runs off to the right (south?) and turns into a 'middle' of the park downhill trail...I call this section "SMILE"! By the time you get to the bottom your smile has to be surgically removed. You could ride or run all these trails...it would be awesome for both. Give it a shot sometime. You'd have to do laps/variations to get any appreciable mileage...but it's beautiful and lightly used, and close by. And then the added bonus (if you ride) is when you make your final trail-climb back up to Skyline Rd, you get the swoopy-fun downhill of Kings Mt Rd. I love the sound of my knobbys 'singing' on the pavement! Fatalism is a rationalization, a coping mechanism, but it isn't reason. False equivalencies aren't reason either. I think rationalizations can show an active conscience though, if one in denial. Beat wrote: "Not use transportation? Fuel? Should we deny most of the world progress? Who decides that?" Beat is not, I believe, a poor third world person trying to heat up some tortillas on a gas stove. He's not riding a crowded rickety bus five hours just to sell a goat. He's flying to run races. Flying to Hawaii, California, Alaska, and Montana to run in ultras is hardly "progress" in the sense of feeding the world or whatever, or hardly an equivalent activity to people trying to scratch out a living. Nor are the natural resources expended even remotely comparable in scale. Flying/ultras are a recreational diversion for people with money enough to fly and time and excess calories enough to train. Beat, you're a great guy, and a great runner. But I rather doubt that you're a third world farmer, nor is your (or my) resource use remotely on the same scale of someone in the third world. Nor does it necessarily follow that flying to Hawaii somehow allows some poor guy to cultivate his field. "Who gets to decide how resources are allocated?" Anon 10:11: I completely agree with you on all points. My resource use is not at all comparable with a third-world farmer. As a resident of the United States, even if I recycle everything I can and buy mostly local organic food and ride my bicycle instead of drive and avoid traveling to limit my fossil fuel consumption, I’m still probably burning up more resources and emitting more carbon dioxide than that third-world farmer, just by nature of the infrastructure around me (my heated office, well-lit grocery store, maintained roads, the list goes on.) But here’s the point I was trying to make is those resources are being used. That carbon dioxide is being pumped into the atmosphere. There are six billion of us vying for these resources, and I think it’s naive to believe that the majority of us, myself and the third-world farmer alike, aren’t using more than what’s sustainable to maintain future generations of 10 billion or 15 billion people. So something is eventually going to have to give — either a massive population decline, or a drastic change in our resource consumption through technological advancements. It’s obvious no one is going to go back to gathering nuts and berries, and even if we all decided to live in the most primitive ways, there aren’t enough nuts and berries in the world to sustain 6 billion of us. We need our industrial infrastructure to survive. I think as individuals the best we can do right now is work to make our own small piece of the world a better place. Be kind to neighbors, preserve open space and wilderness, support our communities and limit resource use as much as we can. There’s still a beautiful here and now we can protect and preserve. But as for the long-term future, you’re right, I’m not optimistic. Fatalism and realism aren’t the same thing. But life is such a unique and fleeting gift that I feel strongly each one of us should dedicate ourselves to “living,” in whatever way you feel you must live. The world stands a chance when those that have a lot, decide to make do with less, thereby allowing those with less, the chance to live a bit more comfortably by (hopefully) having a bit more. Until that is realized there is absolutely no chance of 'sustainability'. Very nice post by the way, and quite nice to see very good responses where people seem to be staying calm and keeping their wits about them. Refreshing. As for farmers ... I don't get how this relates to what I said. The issue is a huge emerging world that can afford to burn more energy. Soon India and China will use much more energy than the US ... if they don't already. But I am absolutely not fatalist. You cannot deny people their consumption ... so you need to make it sustainable, and I think that will happen. Moderation is all good but it just doesn't work on a large scale. I believe problems can be solved. Until then I want engaged people protect parks and nature from being destroyed in various ways ... and since people are mist lkely to be engaged fir what matters to them direcly so i am all for going to place we love - hikers runners bikers - the more tge better. "you cannot deny people their consumption" Absolutely right, so we might as well enjoy this historical bubble of First World comfort, adventure and opportunity for enjoyment of life through consumption. For even if we live ascetic lives of self-denial, there are plenty of the 6 billion people currently here who aren't going to deny themselves. Timely post as yesterday I was thinking something about the carbon footprint of this new relationship. Nature will deny people their consumption eventually; I hope it happens after my kid is dead and gone, but I'm not absolutely confident on that point. That's another issue I've been thinking about recently. I've lived a relatively low-impact lifestyle compared to many Americans. I do recycle, I buy a lot of my things used and sell it or give it away when I'm done, I don't own a lot of excess stuff, I've owned the same 35-40mpg car for 11 years, I bike commute, I don't have any children, and I lead a healthy lifestyle that limits consumption of food and medical resources. And yet I'm going to be judged by how many plane trips I take or paper cups I use during races. So much about the green movement is so political that it begins to lose all basis in reality. Beat and I are just urging people to look at environmentalism from a practical standpoint. For one, it seems so final in a mind-made-up-I've-got-it-figured-out-sorta-way. The problem with that mindset is that you won't be open to new ideas and so you won't change as readily as you may be ready to. Ya know, you may not feel this way at all in 5 or 10 years. Also, for someone who seemingly never gives up and has incredible endurance, your giving up here. Finally, it really borders on the defensive at time. If your secure with your stance, then there is no reason to be defensive. "We are that strange and wonderful animal that has the metaphysical comfort of knowing that she is part of the tragic chorus of natural beings. We are members of that faith that knows that life is indestructibly powerful and pleasurable. And the mark that we will leave upon the world will not be the mark of brute force clothed in the false virtues of the barbarian but the mark of the ultimate realist, he who makes his own world, demanding the impossible and calling it Beautiful." "Art is not a call to passive contemplation (a trip to the museum) but to the activity of human creation. It is this that should replace Adam Smith’s famous “division of labor,” the work that promises only tedium and despair and passivity in the face of destruction. Environmentalism should be about a return to the aesthetic, and I don’t mean the beauties of a mountain vista. I mean a resistance to the Barbaric Heart through a daily insistence on the Beautiful within individual lives, within communities, and in our relation to the natural world." This relates quite a bit to the point I was trying to communicate. Definitely food for thought. I'm going to have to read this guy's book. Excellent post, Jill. I totally agree with you. The 'why even bother' question is so important I think. In the face of overwhelming inertia going the other way, we have limited power. I had to find my answer to that quesion, which for me is: we only have one life, and one vote in how to live it. On one hand it is Nothing, but on the other hand it is Everything. It's all we get, and if we can't even live our own life in line with our values, then we've given up 100% of that Everything. There is a lot of potential power in how we live our lives. Our heros are the ones who turn their own little Everything into an enormous amount of impact. "But life is such a unique and fleeting gift that I feel strongly each one of us should dedicate ourselves to 'living,' in whatever way you feel you must live." OK, so if I feel I need to ride my ATV up and down Jill's running trails and through wilderness areas, I should follow my bliss? Unfortunately, global warming doesn't listen to Deepak Chopra tapes. Person A emits tons of emissions from jet fuel, and Person B in Bangladesh can't follow her bliss because her farm just got drowned in saltwater. Person A gets to run an ultra or gamble in Vegas or whatever; person B gets to, well, die. Population growth is declining. Affluent people everywhere are going to find it more difficult to point their fingers at the more numerous poor when the poor use less resources per capita. It's illogical to say "but I as an individual ultrarunner don't use many resources" but then to say "but let's only consider the poor's use of resources en masse." Population has always been secondary to total consumption. I'd note that China and India's nearly exponential rise in consumption has occurred even as population growth rates have been in decline in those countries. Here's a question: how would people feel if everyone in the world were assigned the same resource budget to spend? Sara: Exactly. Thanks for putting it so succinctly. Anon 10:11: I think you're mistaken in your notion that we need to be assigning blame. We're ALL to blame, and so are our fathers and grandfathers and great-grandfathers who developed this unsustainable system that we're all dependent on. The only argument I make is that our system IS unsustainable over the long-term. Even if we were able to evenly allocate the world's resources we're currently using so all 6.5 billion of us have the exact same share, I still believe it's too much to maintain the status quo indefinitely, even if we somehow level off population growth to zero so we maintain a 6.5 billion world population rather than the predicted rises to 10 billion and more in the next 50 to 75 years. I do not have the answers on what it will take to make our system truly sustainable, although of course every effort to limit impact helps a little bit. - The original spark for this discussion,was the question if "what is the environmental cost of ultrarunning". The argument here is: ultrarunners are a small community, always will be, as evidenced by the numbers in similar sports. If we do or not do something has absolutely minimal impact in terms of measurable effect on the environment. However: it is a lobby, that can lead to preservation, prevention of irrepairable destruction of nature, wildlife etc. In that sense I believe the good by far outweighs the bad. It's a very specific argument. - So how do we influence global warming in general? Note as Jill said, by no means am we are blaming emerging poor countries or using them as an excuse. But in a pragmatic sense, you realize that air travel amounts for 3% of worldwide CO2 emissions, and 50% of air travel is business related. I don't know cargo numbers. From a moral point of view, you are of course correct - everyone should do their best, and I am certainly thinking about ways to make up for my sins, so to speak. But there's really only one way you as an individual can effectively influence CO2 emissions - go VOTE. Because even if 50% of all americans voluntarily decrease their emissions by 50% - (a very difficult to achieve goal for most without significant $$$ investment), the effect is - unfortunately - too small. And of course one has to be careful with that moral argument as well. If you get cancer, or a relative - would you forgo treatment? Or would you take advantage of all that our wasteful civilization has created to save yourself/your loved ones. I think there are only extremely few people who can live up to such a level of consistency (not to say you're not one of them, but they're rare). Anyhow - from a pragmatic point of view, the only way I see things happening is by technological solution at this point. And the only way to do that is to vote for the right people. You can abstain all you want - it's not at all averting the global catastrophe to come. I think the world has gone far past idealism. Focus your energy on the solutions that WILL have an impact. Because you can miss your chance as an idealist just as much as you can as an ignorant person. Oh, and let's get some trains built, no? "The way I see it, the true benefit of environmentalists and do-gooders is not that they actually do good, because that IS completely negligible...."
Negligible? Without dedicated environmentalists in the early 1900s Yosemite, Yellowstone and the other big parks would have been commercially developed. Without them more of the Grand Canyon would be under water. I agree that the day-to-day "do-gooding" has its most effect in subtle ways, but big battles can have big positive results. Jill, great post! Beat you made some good points too. I completely agree with you both. Anon 2:47 I’ve been reading Jill’s post’s for a while if anyone is open to learning and changing it is her. I don’t see her idea as “giving up” it is simply as stance of being at peace. We should all do our best to help with conservatism, but don’t stop living. It would be a shame to not enjoy nature and the beauty of the world. As Beat said the impact of enjoying is world is so negligible. In fact I find that the people who enjoy our world are often the ones who keep it the cleanest; they have something to care about. you're absolutely right, and I was not being clear. The sentence you quoted was referring to the climate change issue - it's global, and needs global solutions, which basically only can be a political solution. As such, you may have better impact by being moderate and convincing your ten neighbors that global warming does exist in the first place than by riding your bike to work (although I'm not saying you should't do that). As I mentioned earlier idealists can definitely have huge political thus actual impact, such as the green party in Germany had which made a lot of environmental issues part of the political mainstream - but even all that did not change that we are a growing consumption based world - to change this would mean to abandon capitalism altogether. But in terms of local conservation I totally agree - and my argument was exactly that the (trail) ultrarunning community has a vested interest in protecting parks and wildlife, and the popularization of ultrarunning surely brings about a lot of engaged people who might otherwise be absent. That's why I think that the carbon cost of ultrarunning itself is by far outweighed by the potential for a highly engaged lobby of people who want to enjoy unspoiled nature. Because as a community I definitely do think we can have great positive impact. Thanks for the clarification. I agree. It isn't at all productive to look at one aspect of our lives when it's the entire package that matters. Decide what's important, enjoy those things, and one can probably way more than "make up" for it in other ways. I read this post last week. And can't get the it and the subject out of my mind. This subject is so complex and brings up so many conflicting feelings. Ultimately it's this: How to be content, be at peace, with this hovering over us? A narrative like Vaughn Lovejoy's helps for sure. But, perhaps, it's too simple...and too easy...which is the allure of it and narratives in general. But most of us need something simple because the complexity can easily overwhelm us and our peace. It's tough. On one hand, come up with a simple answer and be at peace. On the other hand, stay open, refuse to get pulled in by a simple narrative, and hopefully don't get pulled in too deep. An impact-free energy source? Where would that lead us? We would only burn thru the next resource, and then the next. Now energy is a limiting factor. With an impact-free energy source we can haul logs and gravel anywhere, extract any mineral anywhere. Move more consumer goods. Build more factories. Ultimately we would find ourselves at some resource limit. There always is a limit. And I think our human nature pushes us to the brink. Whether we are wise enough to pull back in time remains to be seen. Nothing really to add, I think it's all been said above, but still wanted to thank-you for a very thought provoking article. Very interesting topic, one that I've been battling in my mind for a number of years.